We at Harrison’s would like to express our gratitude to our Canadian friend Angelika Zecha for taking the time to create this cool graphic detailing the progress her beautiful Rosy Bourke’s Parakeet “Posy” made using Harrison’s Bird Foods. Why is it important to switch away from seeds? Is your bird a seed addict? The discussion in regard to seeds fed as a main diet has been an ongoing topic for many decades. 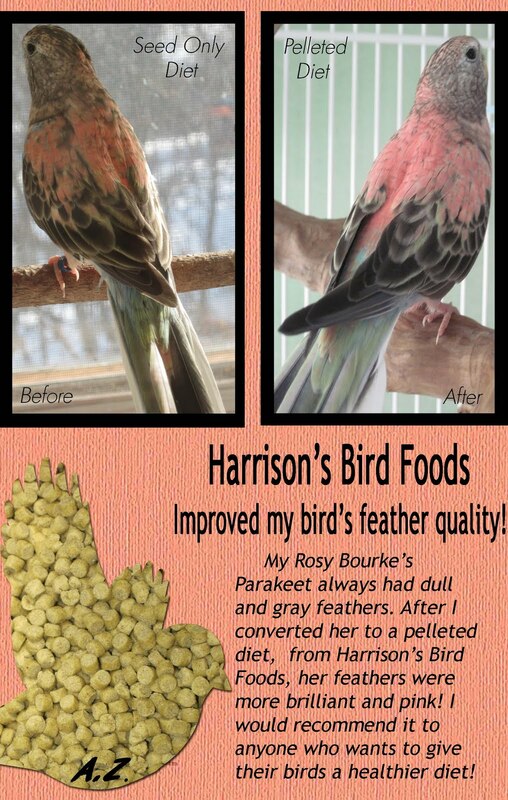 The improvement we see on birds switched from seeds to Harrison’s is profound. Please feel free to contact Harrison’s any time to discuss your bird’s diet. We have a live customer service staff awaiting your inquiries. Harrison’s loves all of our friends from north of the border. Thanks again Angelika for sharing your results!